Britainâ€™s longest running science fiction and fantasy magazine, Interzone has won the Hugo and British Fantasy Awards. Published by UK-based The Third Alternative, Interzone is now celebrating its 213th issue and 25th year of launching the careers of a great many writers and publishing science fiction/fantasy short-listed for many awards. The magazine is currently published every other month, in color, with spectacular trademark cover art often unrivaled by other fiction publications and continues to publish some of the worldâ€™s finest writers and most talented newcomers. Brian Aldiss, Sarah Ash, Michael Moorcock, Bruce Sterling, William Gibson, M. John Harrison, Stephen Baxter, Iain M Banks, J.G. Ballard, Kim Newman, Alastair Reynolds, Harlan Ellison, Greg Egan and many more caliber writers have graced its pages. The Third Alternative recently introduced a new way for readers to enjoy Interzone. Partnering with Internet eBook providers Fictionwise, readers will now enjoy instant access worldwide to Interzone e-Editions, as well as a print version. 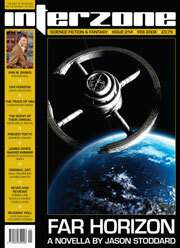 The eBooks debuted with the three latest issues of Interzone: 211, 212, & 213. Future issues will appear alongside the arrival of the print edition. At this time, there are no plans to offer any issues before 211. Fictionwise offers a wide array of eBook formats, which now include formats for the Sony Reader and Amazon Kindle (with wireless download option). Inside each e-Edition of Interzone includes the complete text and color artwork found in the print edition and can be easily read on virtually any electronic device.